The Alaska climate tends to be cold in winter, particularly in the interior. Spring comes late but the short summers are spectacular. Parts of Alaska (Kotzebue and above) are in the Artic Circle. Places in southeast Alaska like Juneau and near the ocean are slightly more moderate, with a climate similar to Seattle's. Days are short in winter; in the summer the sun never really goes down in the northern parts of the state. Alaska has the 5th highest cost of living. In 2014 the inflation-adjusted household income was $71,829, much higher than the $53,482 U.S. median. The Numbeo cost of living plus rent index in Anchorage is 71.5 (New York is 100), os even with the cold and the difficulty in shipping goods here it is still less expensive than New York City.. According to Zillow.com, the mid 2016 median value of homes in Alaska was $266,900. The median price of homes in Anchorage was $293,700 in late 2016 according to Zillow.com. Tax Burden: Alaska is one of 7 U.S. states with no income tax. The tax burden in Alaska is lowest of any state. The Tax Foundation estimates the average tax burden is 6.5% of income. Alaska actually pays a dividend to its residents, $1022 in 2016 (about half of what it was in 2015, thanks to declining oil prices). Marginal Income Tax Rates. Alaska has no income tax. Retirement Income. Retirement income is not taxed. Sales Tax: Alaska has no sales tax. Property Taxes: Only 25 municipalities in Alaska levy a property tax, which can be found on the Directory of Taxing Jurisdictions. Estate and/or Inheritance Taxes. There is no inheritance tax. The estate tax is limited to federal estate tax collection. Link to Alaska Department of Taxation. Alaska does not have a certified retirement community program. 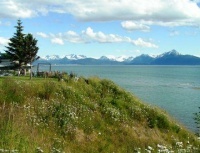 Check out great retirement towns like Homer Alaska and Seward. There are active adult communities nearAnchorage and in some cities. You will also get inside information on retirement living communities in the neighboring states of Washington, Oregon, Idaho, and Montana. More cities and towns are being added constantly. Each Alaska retirement community profile features ratings on expenses, age restrictions, taxes, recreation, amenities, transportation, etc. so you can compare how other active adults 55+ have rated that city or development. There is a Discussion Forum for each Alaska city or development.